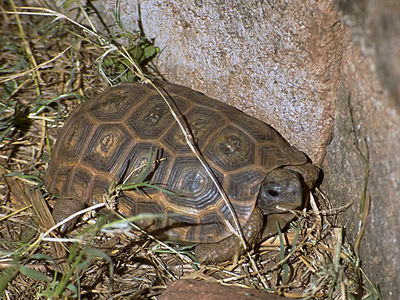 Hinge-back tortoises originally come from the African rainforests, particularly the Ivory Coast, Congo and Nigeria. There are a number of species of hinge-backs, but the Bell’s Hinge-back is the usual pet. An adult hinge-back’s size is up to 9 inches in diameter and weight is about 4 1/2 lbs. When purchasing a hinge-back, check the shell. 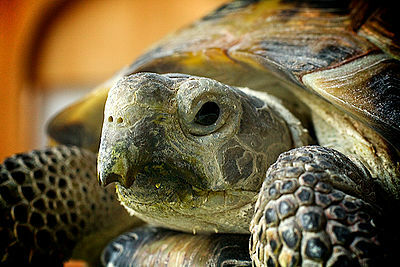 If it is light (weight), the tortoise could be dehydrated. Eyes and nostrils should be clear. 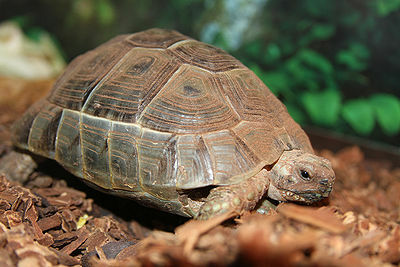 A 30 gallon tank will do for the life of the tortoise. Use UVB bulbs or ceramic heat elements, keeping the temperature at 85-90 degrees Fahrenheit during the day and 75-80 degrees Fahrenheit at night. Hinge-backs are sometimes inactive during the winter months. Hinge-backs are used to high humidity, between 60-90%. Misting the tank several times a day helps to ensure enough humidity. Hinge-backs also enjoy a romp in the water so provide yours with a large shallow bowl. Be sure to check the bowl regularly and change the water as the hinge-back may use it as a toilet. Newspaper, paper towels or shredded coconut bark are good for flooring. They make for easy cleaning. In the wild, hinge-backs eat plants and insects. In a home diet include snails, crickets, earthworms and the like. Popular and important foods in their diet are fruits and vegetables such as tomatoes, bananas, strawberries, mangoes, cantaloupes, green beans,collard, mustard and turnip greens, dandelion, clover, escarole, chicory, kale. For fiber add fresh grass clippings, alfalfa, Timothy hay. Make sure all fruits, vegetables and hay are pesticide free and wash well before feeding. 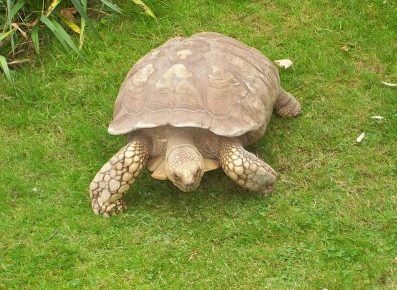 As the name implies, hinge-backs have a hinge on the carapace (upper part of the shell) at the end of the plastron (bottom part of the shell) that develops as they become adults. They have the ability to enclose their bodies using the hinge if they feel threatened or stressed. Hinge-backs are safe pets for children.